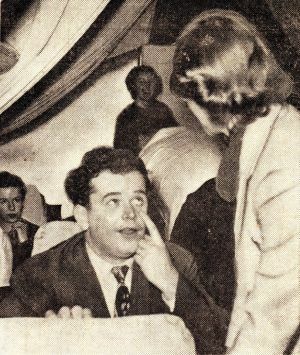 EYE TROUBLE—Jack Gordon pretends he wants Lenore Sheppard, Fan American World Airways stewardess trainee, to help wipe speck of dirt from eye* Lenore was sympathetic but man* aged to elude the follow-up passes faked by Gordon in company test for job candidates. "Honey, what does an air pocket look like?" Blonde Lenore Sheppard, 22, University of Washington graduate and now in training to be a Pan American World Airways stewardess, was baffled. Lenore and other trainees deliberately were harrassed, harrangued and flirted with for a solid hour by a planeload of wolves and smart alecks as a part of their training. Pan American officials watched to see how they reacted. Not always too sure of her facts, for she has been in training only two weeks at Boeing Field, Lenore nevertheless remained cool, calm, respectful and ladylike. Jack Gordon, Seattle publicist who was one of the guests, leered at Lenore without half trying. He asked for help in moving the table on which he was served lunch, then tried to slip his arm around the stewardess. She stayed on the job, but just out of range. 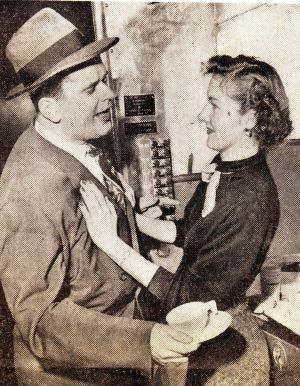 PROBLEMS OF A STEWARDESS—Jack Gordon, Seattle publicist posing as an overly-amorous passenger, tries his Irish blarney on Phyllis Traeger, Pan American stewardess trainee. Gordon invaded plane's galley on pretext of seeking an extra cup of coffee. "How's about you and me having some fun in Honolulu?" Gordon suggested, carrying out the pretense of being an over-amorous passenger. "Oh, I have to return to Seattle," Lenore evaded. "Passengers" constantly demanded this service and that, complained, asked where the parachutes are, when the bar opened, whether they could fly sitting backward.